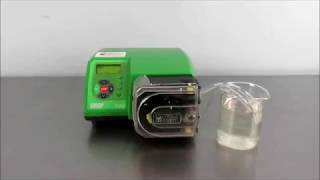 The Watson Marlow 520U Peristaltic Pump offers users rugged, reliable peristaltic pumping action, perfect for sanitary applications, and applications requiring sterility. Peristaltic pumps unlike positive displacement pumps has no crevices or dead spots where residue could build-up, or create pockets of bacterial problems, so there’s no risk of contamination. The Watson Marlow 520U Peristaltic Pump self-primes, can run dry, and has no valves or seals to leak, clog, corrode or replace, while the DC motor is brushless and requires zero maintenance. This pump drive has an adjustable flow rate between 4microliters - 3.5 liters/min through a large swept volume and slow speeds, giving users gentle handling of shear sensitive fluids and predictable long-term operation. The speed range of this peristaltic pump can be controlled from 0.1 rpm to 220 rpm within 0.1% accuracy, making it an ideal choice for metering and dosing, or uninterrupted batch consistency. The 520U pump is capable of remote auto and analogue control, or operation from the up front, large button membrane key pad and digital display. This Watson Marlow 520U Peristaltic Pump has been fully inspected and is performing to expectations. All of out lab equipment comes backed our standard warranty. Should you have any questions, please don't hesistate to contact us.